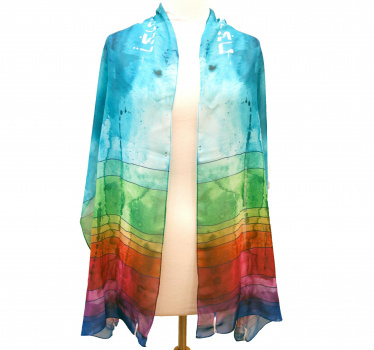 A beautiful tallit reminiscent of shimmering stained glass windows. Painted with every color of the rainbow. This tallit is printed onto 100% poly chiffon, a super soft and lightweight fabric that you'll love to drape around your shoulders. Perfect for bar/bat mitzvah students and adults. Meaures 18" x 72". Each tallit comes with a handmade bag to store the ﻿tallit. Attached are certified Kosher wool tzitzit made in Israel. Advah Designs is run by Sarah Resnick. She started her Judaica business in 2015, and has been dedicated to creating beautiful Jewish ritual objects, manufactured ethically and sustainably. She has been designing and making textiles for over a decade, with a focus on textiles that celebrate ritual and connection. She believes that taking the time to make moments in life just a little more beautiful has an uplifting and rippling effect in our lives and on our communities.